This custom cable railing system is the essence of modern design. Located in Atlanta, Georgia, this handrail system design encompasses the intricate details of sleek, clean lines, with precise and flawless installation. A farmhouse design, simply put speaks welcome home, and this well-designed handrail system says just that…and all we had was a picture! When provided only an inspiration photo by the homeowner from Houzz, our industry leading design team at Southern Staircase duplicated this wood and cable railing system with no specification details. Our designers, when challenged to push past the norm for modern design have done just that, creating a new experience. This cable railing system is a desirable update to traditional materials. From coast to coast we strive to showcase the homeowner’s personal style in our staircase and handrail system projects, from inspiration to installation. The homeowner’s vision of farmhouse style has truly come to life with this complex and avant-garde design. This alluring handrail system with intricate details is built with standard woods manufactured in our state-of-the-art facility. Custom poplar wood newel posts representing the simplicity of modern design. Specially made poplar wood cross members, precisely cut and drilled. Stainless Steel cable cut to exact measurements for a flawless fit. Custom-made poplar wood handrail cut to required specifications creating a seamless flow. 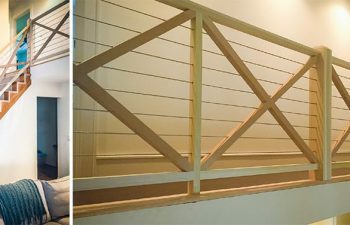 Skill and superior craftsmanship are the keys to this modern cable railing system design. The use of complex skill and technique is what modern design demands, and our team has done just that. A great amount of preparation work was required for this complex handrail system. The cross members and newel posts were carefully pre-drilled on the 3-Axis CNC to ensure flawless installation. Precision placement of the holes for parallel lines and spacing between the posts and cable rail were essential in this design, creating the proper structure for maximum safety. The stainless steel cables, wood newel posts and wood handrail were cut in the field to exact measurements, requiring incredible skill throughout the full installation process. The overall design and installation of this wood and cable railing system ensures ultimate strength and durability. Aesthetic look with contemporary elements, a safe alternative to traditional railings. Durability made from stainless steel cable rails, creating lasting strength. Available for interior and exterior handrail system projects, providing an unobstructed view. Visit our modern railing design and cable railing system galleries for additional details and pictures on our exquisite projects. From inspiration to installation our team is committed to designing and building the highest quality modern staircases and handrail systems. Our reputation speaks for itself and client satisfaction is our highest priority. Contact us today to discuss your next custom staircase project.